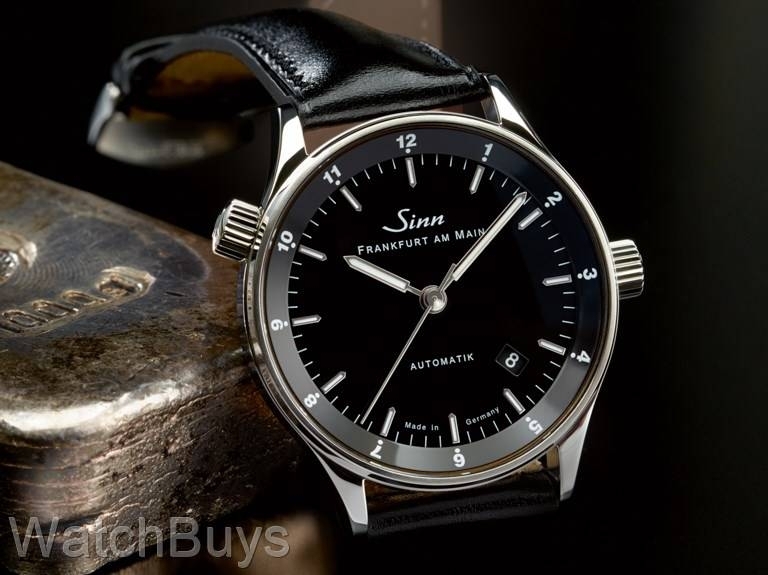 This watch represents the latest addition to Sinn's Frankfurt Finance series and features both a strap, bracelet and other elaborate packaging associated with that series. 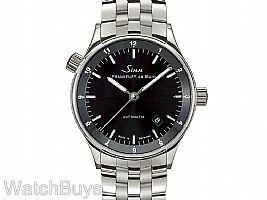 The Sinn 6068 Frankfurt Dual Time Zone represents the cleanest and most simple implementation in the Frankfurt Finance series, and offers a highly functional and highly legible professional timepiece complete with date and 12 hour second time zone display. The second time zone is activated through the crown at 10 which rotates an inner ring protected under the sapphire crystal. The dial is black electroplated and is finished with a sunburst decoration. The hour indices are raised and applied, and are coated with SuperLuminova for excellent visibility at night. The Sinn 6068 features a case made from polished stainless steel and is water resistant to 100 meters. This watch is also low pressure resistant. The Sinn 6068 watch also shares all the features of other models in the Frankfurt Finance Series, including a polished stainless steel case, special "Bull & Bear" financial engraving on the rotor, sapphire crystals on both sides, and elaborate packaging. Included in the packaging are a wooden display box, Sinn black calf leather strap, Sinn polished fine link stainless steel bracelet, additional spring bars, watchmaker's loupe, Sinn tool and metal warranty card. This new watch ships with both the Sinn calf leather strap and the Sinn polished fine link bracelet. Verified Owner Comments: I was eyeing this watch for a while before I ultimately purchased it ... and I'm glad I did. I've really enjoyed wearing it. It's perfect for formal and business casual settings. The bracelet was a bit too long for me initially but I went to a jeweler and they shortened it. Fits perfectly now. The watch comes in a beautiful box with verification card and other tools. Highly recommend. "Sinn Frankfurt Dual Time Zone." 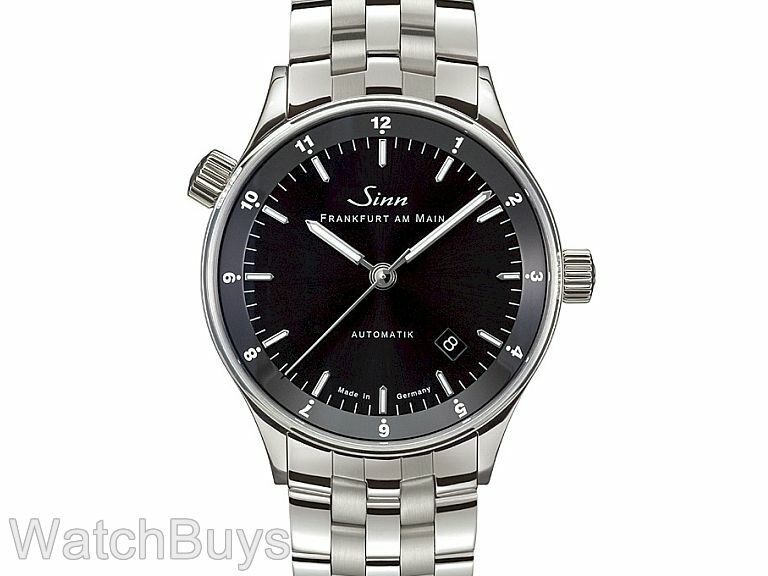 Verified Owner Comments: I have wanted a Sinn watch of this series for a while. I waited a little too late. The alarm watch that I wanted is no longer available. The two time zone watch is the best size for me. With the bracelet, it really shines. I also brought a deployment to go with it. I plan to get a high quality black alligator band to go with it. That combination would really look good. Great watch. I'm glad I didn't delay further it might have been gone too.